Camilla Parker-Bowles Says Kate Middleton Must Curtsy! Camilla Parker-Bowles is saying that Kate Middleton must curtsy to her but Kate is fighting back! The recent Royal Decree on the correct protocol in showing deference in the presence of ‘blood royals’ has pitted Kate Middleton squarely against Camilla Parker-Bowles. Which is actually kind of absurd since neither are blood royals! Queen Elizabeth II recently ordained that Kate must curtsy before blood royals such as Princess Beatrice and Princess Eugenie whenever Prince William is not around. The reasons for this decree are ostensibly based on the royal ranking system which places blood royals above those who enter the Royal Family through marriage. However the truth is that many senior royals are in a jealous snit over Kate’s success and popularity – especially her preferential placement right beside the Queen at major events during the Diamond Jubilee celebrations. So Queen Elizabeth offered up a ‘curtsy cure’ to placate the envious royals – Kate might be much more important – she will mother the future monarch – and much more popular than these entitled but useless senior royals – but they will make sure she knows that her place is beneath them for as long as possible. Enter evil Camilla – Prince Charles’ half-mad wife… Camilla is not a blood royal but since she is married to the current heir she ranks above Kate. Camilla is burning with rage since learning that Charles is paying for Kate’s expensive designer wardrobe. According to a source: “Word is all the beautiful clothes that have made Kate a fashion icon have been paid for by Charles – to the tune of more than $54,000 so far this year,” the insider says. “Camilla hit the roof. She raged that Charles had no business helping the ‘upstart’ show her up in public. 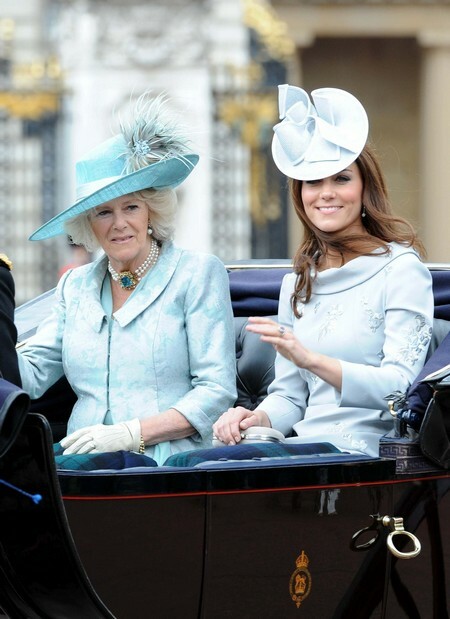 She demanded he double her allowance for her designer working clothes and slash Kate’s by half.” No doubt Camilla will try to have Kate curtsying on command like a trained animal – and no doubt Kate will resist! GLOBE Print Edition, July 16 has the scoop on the palace gossip. Prince William’s beautiful wife Kate is locked in a new war with her evil royal rival Camilla Parker Bowles after she was ordered to follow a set of new palace rules-and curtsy to her mother-in-law in public! Updated protocols approved by her Majesty pushed Kate down the palace pecking order below Charles’ scheming second wife. The new instructions were circulated to all royal households. They mean that Kate has to curtsy even to minor royals like. Princess Beatrice and Eugenie the daughters of Prince Andrew and his ex-wife, Fergie the Duchess of York, because they are descended from the direct royal bloodline. Though Camilla is a non-Royal divorcee, her husband is the Prince of Wales and the designated heir to the throne ahead of his eldest son William. This means she outranks gorgeous Kate, who comes from common stock. The world watches Kate as if she were the most celebrated Hollywood star and the media report on every detail of her existence. Meanwhile, back in their palaces the jealous royals continue to play their silly game. It doesn’t matter – Kate is the best – she will win. Just wait until her pregnancy is announced. Expect it to be soon!